The cruel key to individual prosperity: choosing the right ancestorsPBS News Hour: Making Sen$e, July 16, 2014. The American Dream is an Illusion: Immigration and Inequality. Foreign Affairs, August 26, 2014. Je sociale status staat in je genen geschreven. de Correspondent (Netherlands), Sept. 18, 2014 (Rutger Bregman). Efternamnens sega struktur. Forskning&Framsteg (Sweden), Aug 22, 2014. Is Social Mobility a Myth? The American Conservative (Gene Callahan), July 31, 2014. Aufsteig aus der Familienkiste. Die Presse (Oliver Grimm), July 12, 2014. Bon sang ne saurait faiblir. Le Monde (Baptiste Coulmont), Jul 7, 2014. What's in a Name? Everything. The Atlantic (Benjamin Friedman), July/August 2014. All in the Second Name. Business World (Shankar Jaganathan), July 2014. It Pays to Choose Your Ancestors Carefully. Quadrant Magazine (Australia) (Peter Murphy), June 2014. Synthesis: Where Have You Gone, Horatio Alger? Harvard Business Review Magazine (Tim Sullivan), June 2014. Class Inaction. The Quarterly Review (Edward Dutton), May 21, 2014. Does Capitalism Create Social Mobility? Strategy+Business (Theodore Kinni), May 21, 2014. The Remarkable Persistence of Power and Privilege. Sidney Morning Herald (Andrew Leigh), May 17, 2014. For Whom the Bell Curve Tolls. The Chronicle Review (Eli Cook), May 12, 2014. Jellyfish McSaveloy and the social mobility of surnames. New Statesman (Sophie McBain), May 8, 2014. The Great Grandson Also Rises. Econlib.org (David Henderson), May 7, 2014. De beste familier. Dagens Næringsliv (Norway) (Bård Bjerkholt), May 6, 2014. Heridability of Social Status. Econlib.org (Arnold Kling), May 5, 2014. Franco-Americans are the unlikely underclass. Bangor Daily News (Tom Oliver), May 5, 2014.
Review, Library Journal, May 1, 2014. The Remarkable Persistence of Power and Privilege. Inside Story (Australia) (Andrew Leigh), April 30, 2014. Spokój klas: Dlaczego biedni zawsze pozostana biednymi? Gazeta Prawna (Warsaw) (Rafał Woś), April 30, 2014. Does a baby's name affect its chances in life? BBC News Magazine (William Kremer), April 11, 2014. What's in a Surname? Success, Maybe. Caixin Online (Richard Cooper), April 3, 2014. Debunking the Myth of Social Mobility. Bloomberg Businessweek (Brendan Greeley), April 3, 2014. What's in a Name? Literary Review (Erik Kaufman), March 29, 2014. 'Sipag at Tiyaga' is crap. Success is about surnames. Manila Times (Marlen V. Ronquillo), March 25, 2014. Your ancestry may be your destiny. Toronto Globe and Mail (Margaret Wente), March 22, 2014. Il vero segreto del successo? È nel cognomen. Venerdi La Repubblica (Dedo Tortona), March 21, 2014. Choose Your Ancestors Carefully. Enlightened Economics (Diane Coyle), March 19, 2014. Having a venerable name can be a key to upward mobility. Washington Examiner (Michael Barone), March 19, 2014. Votre réussite socio-économique dépend-elle de vos gènes?Slate.fr (Jean-Laurent Cassely), March 17, 2014. Want Success: Choose the Right Parents. Bloomberg View (Clive Crook), March 16, 2014. El éxito se hereda. El Meridiano de Córdoba, March 16, 2014. Book Review: The Son Also Rises. Wall Street Journal (Trevor Butterworth), March 14, 2014. Research of historical surnames suggests social mobility is low for generations. Washington Examiner (Joseph Lawler), March 14, 2014. Social Mobility and The Son Also Rises: The Bad. March 11. Social Mobility and The Son Also Rises: The Ugly. March 12. 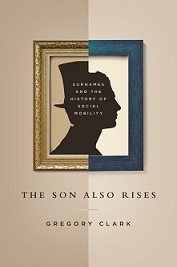 Social Mobility and The Son Also Rises: Reply from Clark. March 14. Social mobility: a family affair. Financial Times (Gillian Tett), March 7, 2014. Samurai Spirit: Progeny of Japan's Warrior Elite Retain Edge Today. Wall Street Journal-Japan (Alexander Martin), March 4, 2014. If you want to improve social mobility, Mr Cameron, dish out new genes. Sunday Times (Harry Mount), March 2, 2014. Meritocracy doesn't work. It's in the Left's interest to recognise this. The Spectator, Jan 30, 2014. What's in a name? Quite a lot, it seems. VoxEU (Viv Davies), April 4, 2014. Gregory Clark on Names. Social Science Bites (Dave Edmonds), April 2, 2014. Marketplace, NPR. March 24, 2014. Social Mobility: are we too complacent? BBC World Service, The Forum. March 22, 2014. Gregory Clark on Social Mobility. Prospect Magazine (Jonathan Derbyshire), March 14, 2014. The Why Factor - Family Names. BBC World Service, March 14, 2014. Audio. Thinking Allowed. BBC Radio 4, March 5, 2014. Podcast. Intergenerational Wealth Mobility in England, 1858-2012. Surnames and Social Mobility (Dec, 2013) (with Neil Cummins) (forthcoming, Economic Journal, 2014). Surnames: a New Source for the History of Social Mobility (Feb, 2014) (with Neil Cummins, Yu Hao, Daniel Diaz Vidal). Forthcoming, Explorations in Economic History, 2014. Social Mobility in Japan, 1868-2012. The Surprising Persistence of the Samurai (2012) (with Tatsuya Ishii). Social Mobility in China, 1645-2012. A Surname Study (November, 2012) (with Yu Hao). Basso, Gaetano, Andrea Catania, Giovanna Labartino, Davide Malacrino, Paola Monti, and Michele Pellizzari, "Family Ties in Licensed Professions in Italy." Working Paper. Collado, M. Dolores, Ignacio Ortuño Ortín, and Anrés Romeu, 2008, “Surnames and social status in Spain,” Investigaciones Económicas, vol. 32, no. 3, pp. 259-287. Collado, M. Dolores, Ignacio Ortuño-Ortín, Andrés Romeu. 2013. “Long-run intergenerational social mobility and the distribution of surnames.” Working Paper. Garza-Chapa, Raúl, María de los Angeles Rojas-Alvarado, and Ricardo M. Cerda-Flores, 2000, “Prevalence of NIDDM in Mexicans with paraphyletic and polyphyletic surnames”, American Journal of Human Biology, vol. 12, no. 6, pp. 721-728. Güell, Maia, Rodrigue Mora, Jose Vicente and Chris Telmer, 2007. “Intergenerational mobility and the informative content of surnames.” CEPR Discussion paper No 6316. King, Turi E. and Mark A. Jobling. 2009. “What's in a name? Y chromosomes, surnames and the genetic genealogy revolution,” Trends in Genetics, 25(8): 351-360. Lasker, Gabriel W. 1985. Surnames and Genetic Structure. Cambridge University Press. Olivetti, Claudia, and M. Daniele Paserman. 2013. “In the Name of the Son (and the Daughter): Intergenerational Mobility in the United States, 1850–1930.” NBER Working Paper no. 18822. Paik, Christopher. 2013. “Does Lineage Matter? A Study of Ancestral Influence on Educational Attainment in Korea.” Working Paper, New York University Abu Dhabi. Peña, Pablo A., 2013, “Surname Frequency and Lifespan,” manuscript. Weyl, Nathaniel. 1989. The Geography of American Achievement. Washington, DC: Scott-Townsend.